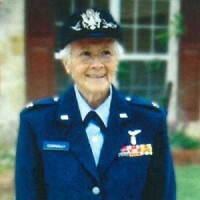 Janet M. Connolly, Colonel, USAF (Retired), a dear friend to all she met, passed away on December 30, 2015. To know her was to love her, and her passing leaves those of us remaining to celebrate her life. Janny was born on August 12, 1933 in Cresco, Iowa to William (Irish) and Frances (Tatty) Barth Connolly. She attended Cresco schools, graduating from Cresco High School in 1951. In 1955, she graduated from the University of Iowa with a Bachelor of Science in Nursing Degree and that September she started her nursing career as a school nurse in Galesburg, IL. In November 1957 she joined the U.S. Air Force, initially working as an obstetrical nurse before enrolling in the USAF School of Anesthesia in San Antonio, TX. After graduating, she served as a nurse anesthetist practitioner, teacher, and administrator at AF hospitals throughout the world. While stationed in Pakistan, she volunteered to provide anesthesia services on her off duty time in the local community where current drugs and equipment were often archaic or not available. She provided high level anesthesia care to the local community due to her innovative thinking and anesthesia skills. Janny helped care for her parents when she returned from assignments in Pakistan and Thailand. They loved being together on further assignments in Alaska, Texas, California and Colorado. Her older sister Judy even spent a year together with them in Alaska. Probably her favorite assignment was in San Antonio as the Deputy Chief Nurse Anesthetist of the largest anesthesia program in the USAF as well as the Deputy Director of the USAF School of Nurse Anesthesia, where she was loved by the students, staff and patients. Her skills and love for her profession were contagious, and her outstanding leadership in demanding positions throughout her USAF career garnered her many prestigious awards and citations. Upon retiring from the USAF, Janny continued to use her anesthesia skills in the civilian community. She was the Co-Director of the Dannemiller Memorial Foundation Continuing Education Program for Nurse Anesthetists, and she co-edited three prestigious monthly publications in Anesthesiology – Anesthesia File, Analgesia File, and Anesthesiology Review. Janet was a scholar, teacher, outstanding anesthetist, exemplary leader in the USAF, and was one of the kindest and purest persons in the world. She was truly too good to be true, and was loved by so many. Preceding her in death were her parents and sister, Judy, and her Aunt Ruth Korbin, all of whom were cared for by Janny in their last years. Surviving are cousins, Sally (Barth) of Cedar Rapids, IA, John and Dodi Barth of Indianapolis, IN, and David and Nancy Connolly and Deborah-Connolly Conover of Portland, OR, and her adopted family, the Gronemeyers. Janny is also survived by a multitude of other very dear and close friends from the University of Iowa, the USAF, and a multitude of others who will forever keep her in their memories. Interment with Military Honors will follow in Fort Sam Houston National Cemetery. In lieu of flowers, donations may be directed to the Christus Santa Rosa Hospice, the American Lung Association, or the University of Iowa College of Nursing PhD Scholarship for the Nurse Anesthesia Program. P.S. "My final wish is that you please vote constitutionally conservative in 2016."